Zuni fetishes are small carvings made from various materials by the Zuni people. These carvings have traditionally served a ceremonial purpose for their creators and depict animals and icons integral to their culture. As a form of contemporary Native American art, they are sold with secular intentions to collectors worldwide. The Zuni Fetishes at King Galleries all come directly from the Zuni Pueblo and each is hand carved. This Zuni carving by Herbert Pincion is carved from spotted travertine. 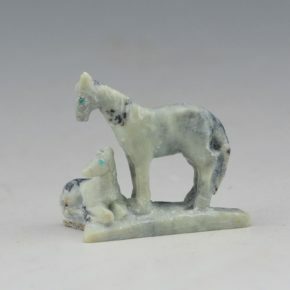 It is a highly detailed carving with a mare and sitting foal. For the size, it is wonderfully detailed! Vickie Quandelacy is a sister of Stuart Quandelacy and daughter of Dickie and Amy Quandelacy. She is known for her complex design of corn maidens. This corn maiden is carved out of green snail shell. She has captured the shape of the shell and etched the corn design and dragonflies in as the design. The back has the etched hair and more dragonflies. 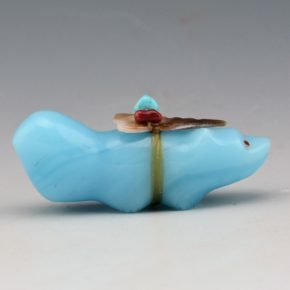 The piece is set onto a piece of turquoise. The opalescene of the shell is striking on this piece! This is an exceptionally detailed Zuni carving by Derrick Kaamasee. It is carved from turquoise. There is an elk standing up on a rock. There is detail in the fur and the movement. It is signed on the bottom. This Zuni carving is by Freddie Leekya. The bird is carved from travertine. There are turquoise inlay for the eyes and on the wings. 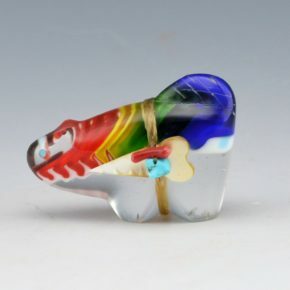 The beak is mother of pearl. This Zuni carving by Tim Lementino. 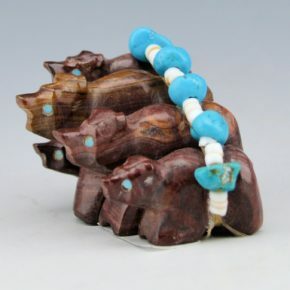 It is a group of five bears carved from pipestone. They each have turquoise eyes. There is a bundle holding them together from shell and turquoise. 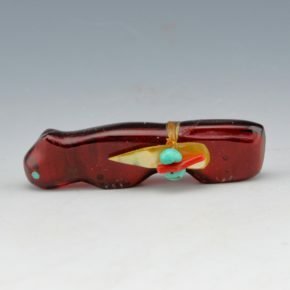 This Zuni carving by Rodney Laiwakete is carved from agate. There is a Big Horn Sheep which has an inlaid turquoise and moher -of -pearl heartline. 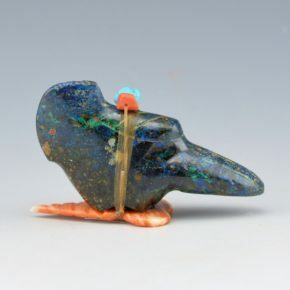 The bird on the back is also carved from agate. It is attached as a medicine bundle. 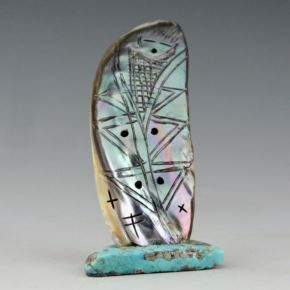 This Zuni carving by Lena Boone is made from glass. The mountain lion is traditional in shape and has an arrowhead bundle on its back. The glass is a deep red coloration. This Zuni carving by Daphne Quam is made from glass. The mountain lion is traditional in shape and has an arrowhead bundle on its back. The glass has a green, blue, yellow and clear coloration. This Zuni carving by Daphne Quam is made from glass. The beaver is traditional in shape and has an arrowhead bundle on its back. The glass has a green, blue, yellow and clear coloration. 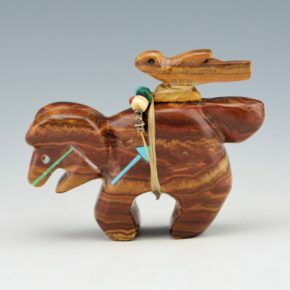 This Zuni carving by Daphne Quam is made from sodalite. The badger is traditional in shape and has an arrowhead bundle on its back. 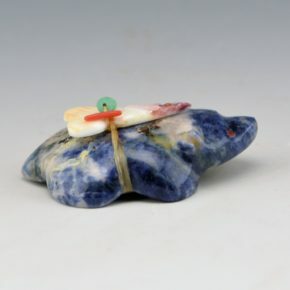 The sodalite has a deep blue and white coloration. This Zuni carving by Daphne Quam is made from azurite. The eagle is traditional in shape and has an arrowhead bundle on its back. 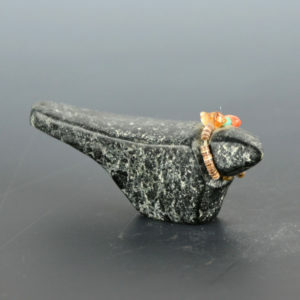 The azurite has a deep blue coloration with specs of green. 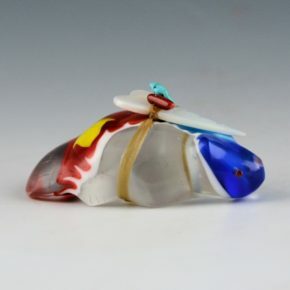 This Zuni carving by Daphne Quam is made from glass. 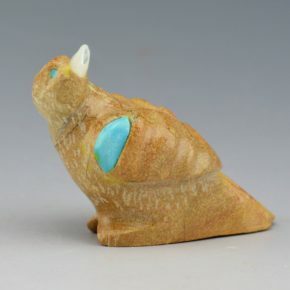 This fox is traditional in shape and has an arrowhead bundle on its back. The glass is a opaque blue coloration. Mike Romero is from Taos Pueblo and married to potter Susan “Snowflake” Romero. While he helped with her pottery over the years, he also carved fetish figures. 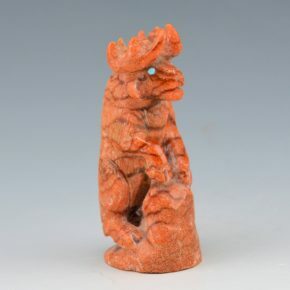 This eagle is carved from steatite and there is a fetish bundle around the neck. He has an amazing old-style type of carving. Mike rarely carves today, the piece is from a collection from the 1990’s.